White potatoes are a starchy tuber that contain a substantial dose of carbohydrate when cooked and enjoyed in a variety of ways. Healthy, active people can benefit from eating white potatoes because white potatoes can replenish glycogen stores after intense exercise and help regulate cortisol. Carbohydrates are also important for women’s hormonal health and for those recovering from adrenal fatigue. Low carbers who want to avoid carbs due to metabolic disorders like diabetes, may want to avoid consuming white potatoes. However, healthy people can enjoy white potatoes mashed, roasted in wedges or stuffed with ground meat! Orange dots shows how 1 medium white potato fits into the typical nutrient profile of a Paleo meal. White potatoes are an Irish staple and loved by many in the form of chips and fries. 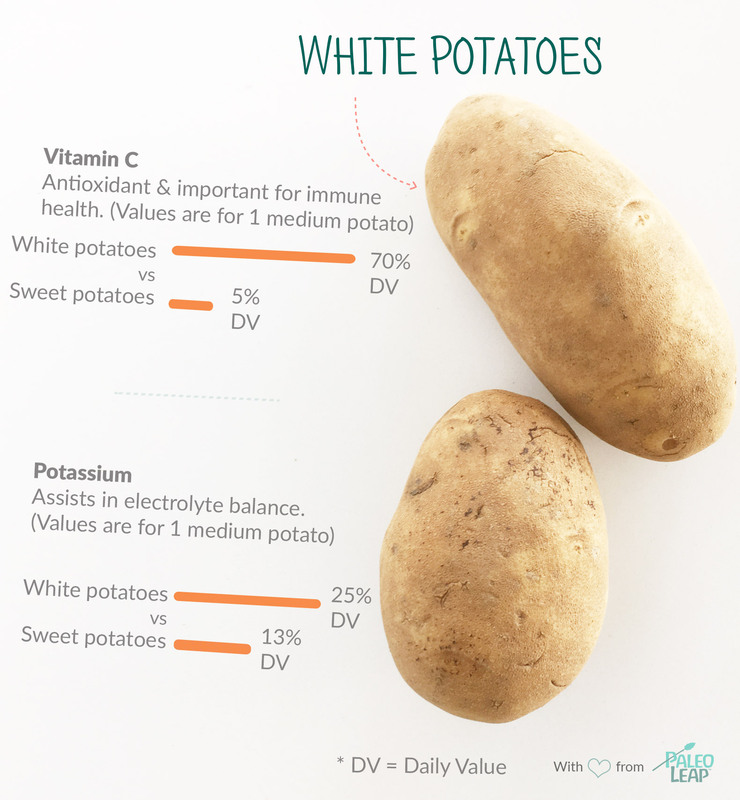 White potatoes are often demonized, but when white potatoes are prepared in a healthy manner, they can be a good source of carbohydrate, Vitamin C and calories! VARIETIES: There are hundreds of varieties of potatoes, however there are usually a handful of popular varieties at the supermarket, like Yukon Gold and Russet potatoes. SELECT: Potatoes should be firm and smooth, while also free from decay, sprouting and discoloration. STORAGE: Store in a cool, dark place. Wash potatoes just before use. Cooked potatoes will keep in the fridge for a few days. Simmer potatoes and veggies, then puree into a soup. Halve potatoes, then stuff with ground meat and veggies. Cut potatoes into wedges, lather in a cooking oil and salt and pepper, then roast in the oven. Boil then mash potatoes; mix in garlic, olive oil and herbs.